De-scheduled by Historic Scotland 30/04/2002 . See associated documents for further information. NAI Local Plan, Dec. 2000: P21/8. Tourism & Recreation. The last recorded reference to a castle on this site was1596, excepting mention of Castledown of Rait in 1622. Simpson, W D, 1937, 'Rait Castle and Barevan Church, Nairnshire', Proc Soc Antiq Scot Vol. 71 1936-7, p.98-115, 98-111 (Text/Publication/Article). SHG1385. Cruden, S, 1960, The Scottish castle, 97-99 (Text/Publication/Volume). SHG2085. Simpson, W D, 1961, 'The castles of Duffus, Rait and Morton reconsidered', Proc Soc Antiq Scot Vol. 92 1958-9, p.10-14, 12-13 (Text/Publication/Article). SHG1630. 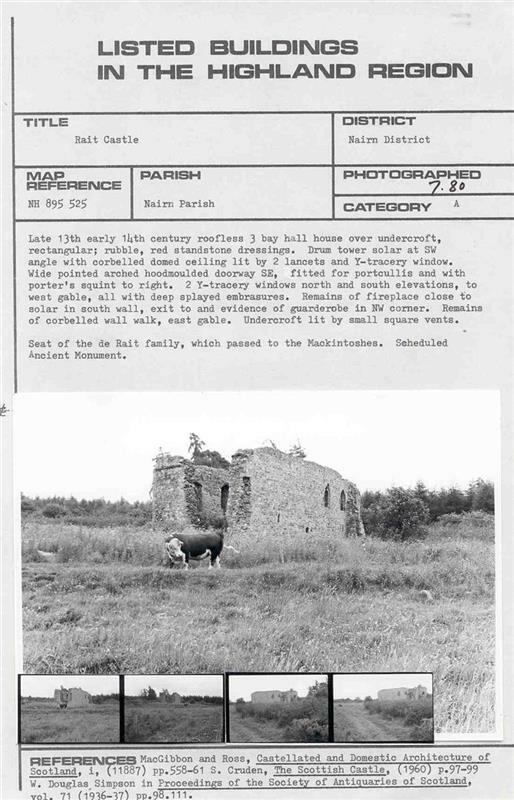 RCAHMS, 1978, The Royal Commission on the Ancient and Historical Monuments of Scotland. The archaeological sites and monuments of Nairn District, Highland Region, 18, No. 136 (Text/Report). SHG2672. Close-Brooks, J, 1986, Exploring Scotland's Heritage: The Highlands, 98-9, No. 44 (Text/Publication/Volume). SHG2053. Love J, McMullen E (ed), 1994, A Salmon for the Schoolhouse, A Nairnshire Parish in the C19 (Text/Publication/Volume). SHG2425. --- Image/Photograph(s): Rait Castle.. Colour Slide. .
--- Text/Publication/Article: Simpson, W D. 1937. 'Rait Castle and Barevan Church, Nairnshire', Proc Soc Antiq Scot Vol. 71 1936-7, p.98-115. Proc Soc Antiq Scot. 98-115. 98-111. --- Text/Publication/Article: Simpson, W D. 1961. 'The castles of Duffus, Rait and Morton reconsidered', Proc Soc Antiq Scot Vol. 92 1958-9, p.10-14. Proc Soc Antiq Scot. 10-14. 12-13. --- Text/Publication/Volume: Close-Brooks, J. 1986. Exploring Scotland's Heritage: The Highlands. 98-9, No. 44. --- Text/Publication/Volume: Cruden, S. 1960. The Scottish castle. 97-99. --- Text/Publication/Volume: Love J, McMullen E (ed). 1994. A Salmon for the Schoolhouse, A Nairnshire Parish in the C19. --- Text/Report: RCAHMS. 1978. The Royal Commission on the Ancient and Historical Monuments of Scotland. The archaeological sites and monuments of Nairn District, Highland Region. . 18, No. 136.